One of Mari's unavoidably cute puppies in A Tale of Mari and Three Puppies. The Skinny: Those expecting a tearjerker about dogs surviving the wilderness after a major earthquake may be disappointed that the film is more about the human than the dogs. Nevertheless, A Tale of Mari and Three Puppies features enough cute dogs to melt a dog lover's heart. In the 1988 film The Bear, two bears braved the dangers of the wilderness in order to survive. The Bear featured very little human dialogue, but the plight of the bears remained just as captivating, and the film set a benchmark for an animal survival story. One might expect similar things from the based-on-real-life A Tale of Mari and Three Puppies, as the source material implies a touching film about dogs miraculously surviving natural obstacles. However, director Ryuichi Inomata and his team of three writers instead churn out a film that would be more appropriately named A Tale of Puppies and the Kids That Loved Them. 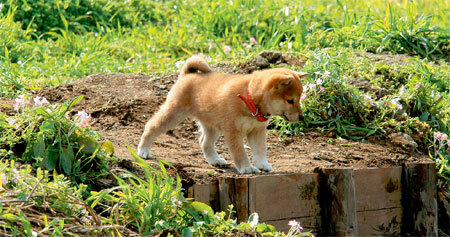 Adapted from the graphic novel Mari and the Three Puppies of Yamakoshi, the film is based on the true story of how a dog and her puppies survived the aftermath of the magnitude 6.9 Chuetsu Earthquake in 2004. The dogs were abandoned during the emergency rescue efforts, despite the mother dog's part in keeping its owner alive. The dramatized version of the story adds kids Aya and Ryota to compete with the dogs for the title of "cutest beings in the film". Here, the kids are siblings who first find Mari as an abandoned puppy and decide to take her home. After some effort and help from their grandfather (who, unlike the kids, does exist in the real story), Mari becomes a member of the family. The film takes the entire first act to set up how Mari is accepted into this family and how they come to love her. Veteran television director Inomata sticks to the safe family film route, putting the kids and Mari front and center. While the kids are cute and likeable, Mari is clearly the star of the film. The dogs take on an even bigger role when Mari inexplicably becomes a mother to three even cuter little puppies. Life is good until an earthquake strikes the town, trapping Aya and her grandfather inside their collapsing house. After much effort to protect her own babies, Mari manages to save Aya and her grandfather's lives by leading rescuers to the collapsed house. However, just as it happened in real life, Mari and the three puppies are forced to fend for themselves in the destroyed village. Since the film is supposedly about Mari and her three puppies (hence the title), one would expect the focus to shift to how the dogs survive the ordeal. But Inomata devotes only ten minutes during the second hour to show what the dogs are up to. Instead of the expected storyline, A Tale of Mari and the Three Puppies actually deals with how the kids react to leaving their beloved dogs behind. The filmmakers even deal briefly with survivors' guilt, as the grandfather laments over the forced abandonment of the dogs. However, the filmmakers set their sights too wide by also covering other people in the town affected by the earthquake. As a result, the dogs' ordeal is almost completely ignored when the third act rolls around. Inomata sets up an affecting relationship between the dogs and their owners with his extended setup, and the shot of Mari chasing after the helicopter is guaranteed to melt just about anyone's heart. However, the setup benefits the kids, rather than the dogs. When the earthquake hits, the film spends an almost frustrating amount of time putting the humans in peril, instead of concentrating on the million-dollar question, namely "how did the dogs manage to survive?" The kids get into more serious peril - and take more screentime away from the dogs - when they try to rescue the dogs on their own. Thankfully, the kids are sympathetic characters worth following, in large part due to touching performances from the children. However, the script also falls deep into television drama conventions, with emotions expressed in extended speeches about parenthood and protecting loved ones.  The true story can be found here.